Pizza wasn't on the menu, but basic fare, 19th-century style, was. Before Congress was a mess, it had a mess -- as in a mess hall. Like today's members of Congress who share dumpy Capitol Hill row houses, 19th century lawmakers bunked in boarding houses. Historian and AFR contributor Amanda Moniz tells all. Stories occasionally appear about the living arrangements of members of Congress on Capitol Hill. Apart from their families and in Washington for only part of the week, some congressmen (and the stories do focus on congressmen), share messy, overcrowded homes with fellow lawmakers. Their refrigerators, we read, are stocked with little more than beer, which they quaff while noshing on pizza and watching a football game together. In the 1800s, congressmen also lived with their colleagues. Living not in crash pads but boarding houses - although their reputations were not necessarily much better -lawmakers dwelled and ate together. Pizza wasn't on the menu, but basic fare, 19th-century style, was. Pumpkin pudding was a staple on boarding house menus. Try this recipe. Like members of Congress, many Americans in the 1800s lived in boarding houses. As a market economy developed in the 19th century, people left farms for jobs as clerks, factory workers and other urban occupations. At the same time, the old practice of apprentices or employees living with masters was waning and, in addition, urban populations were growing with the arrival of new immigrants. As a result, huge numbers of urban dwellers turned to boarding houses. As many as half of city residents were either tenants or keepers of boarding houses. Away from home when they were attending Congress, lawmakers did what their fellow Americans did and took up residence in boarding houses. Their experience, however, differed in an important way. Congressmen typically chose which Capitol Hill boarding house they would lodge in based on their state or on their political affiliation. Their groupings were known as "messes," as in mess hall. Members of the Tennessee delegation, for instance, or a group of Whigs might make up a mess, though often the messes would include one or two congressmen from a different state or party. 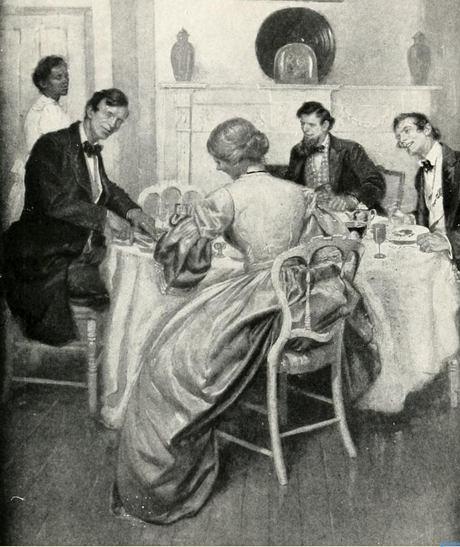 Boarding house life, therefore, played an important role in building lawmakers' relationships both with allies and across various political lines. Besides rooms, of course, boarding houses - for ordinary Americans and congressmen alike - provided board, that is meals. Served three meals a day by their landladies, residents ate together - and complained together. The food was bad, they said, and they didn't get enough. The meat was dry, the cake was dry, the toast was dry. The food, many agreed, was blah. With budgets to keep in mind and a lot of work to do, landladies made basic, economical food. Beef, pies, puddings and cakes - all simple to make and sized to serve a crowd - were on tables often. For more on Congressional boarding houses -- and for the recipes that accompany this story -- please visit American Food Roots.